Spotted spiny lobster Panulirus guttatus, copyright Jarek Tuszynski. The Stridentes are a clade of spiny lobsters possessing a stridulatory organ at the base of the antenna. During reproduction, males spread a hardened or gelatinous speramtophoric mass across the posterior sternal segments of the female, from which sperm are released by actions of the latter (George 2005a, b). [CN01] Chan, T.-Y., & P. K. L. Ng. 2001. 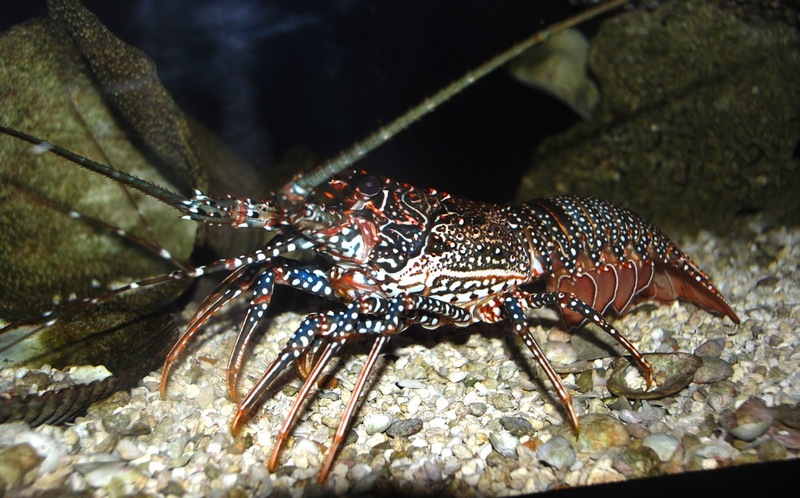 On the nomenclature of the commercially important spiny lobsters Panulirus longipes femoristriga (von Martens, 1872), P. bispinosus Borradaile, 1899, and P. albiflagellum Chan & Chu, 1996 (Decapoda, Palinuridae). Crustaceana 74 (1): 123–127. [G05a] George, R. W. 2005a. Comparative morphology and evolution of the reproductive structures in spiny lobsters, Panulirus. New Zealand Journal of Marine and Freshwater Research 39 (3): 493–501. [G05b] George, R. W. 2005b. Evolution of life cycles, including migration, in spiny lobsters (Palinuridae). New Zealand Journal of Marine and Freshwater Research 39: 503–514. [KM05] Kulmiye, A. J., & K. M. Mavuti. 2005. 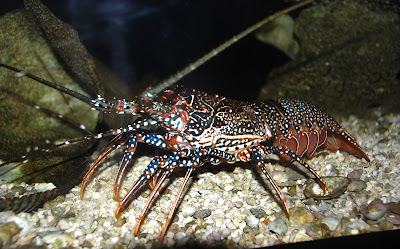 Growth and moulting of captive Panulirus homarus homarus in Kenya, western Indian Ocean. New Zealand Journal of Marine and Freshwater Research 39 (3): 539–549. [RD05] Radhakrishnan, E. V., V. D. Deshmukh, M. K. Manisseri, M. Rajamani, J. K. Kizhakudan & R. Thangaraja. 2005. Status of the major lobster fisheries in India. New Zealand Journal of Marine and Freshwater Research 39 (3): 723–732. [SBL05] Sharp, W. C., R. D. Bertelsen & V. R. Leeworthy. 2005. Long-term trends in the recreational lobster fishery of Florida, United States: landings, effort, and implications for management. New Zealand Journal of Marine and Freshwater Research 39 (3): 733–747.